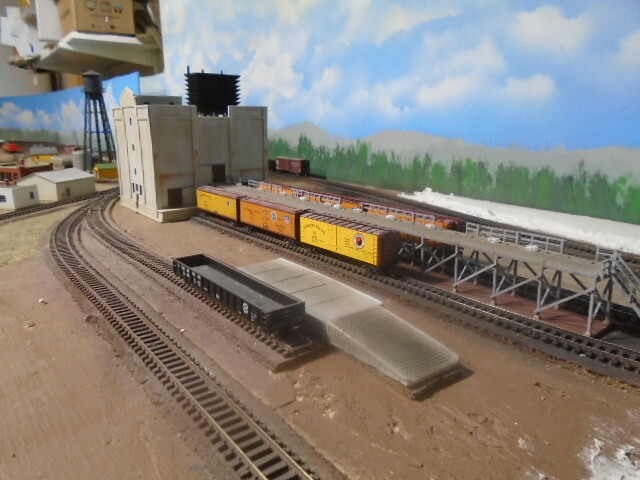 Got the ice plant (cut down Cornerstone kit) done yesterday, so the next step is working on the attached icing dock. Today also have a few more smaller structures in different stages of progress. I was dissatisfied with the color I was using to represent SP's Colonial Yellow, so I went looking for a better color which I found in Delta's "Empire Gold", so repainted a couple of built structures and used it on the train order building under construction. I also got the ice platforms completed and mated with the ice plant. All that remains to is to completing disguising the base once the scenery is completed in this area. I also painted and weathered the team track dock in the foreground. The MOW train is getting longer with the completion of the 12-1 conversion (yes I turned the truck the right way from the last weekend update) and the A-50-6 automobile boxcar tool car conversion. I still have a water car to finish. 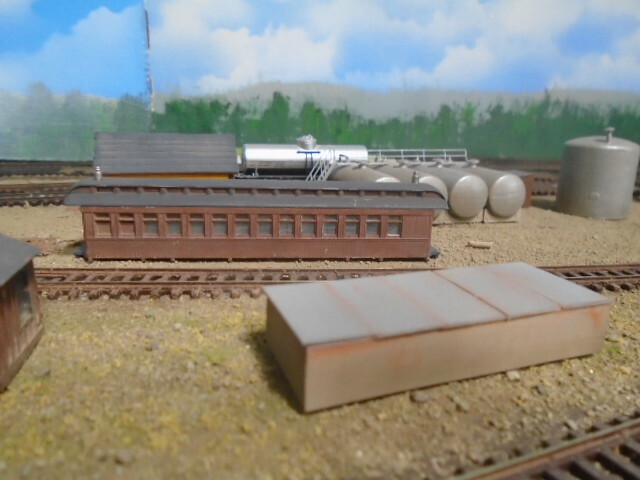 Finished the Brooklyn Yard train order station today with the addition of the station names and a bit of weathering. 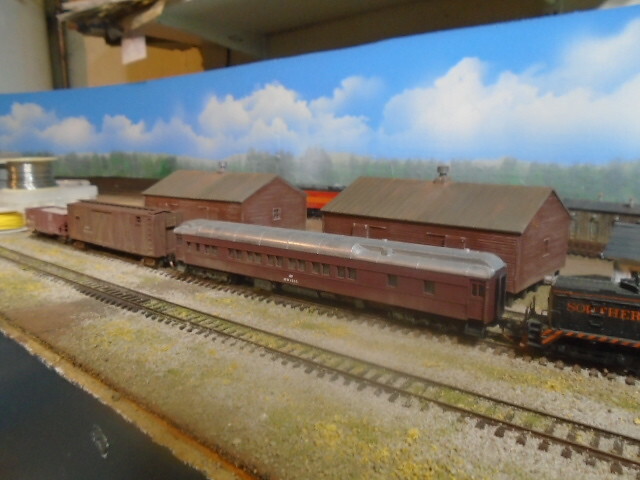 This is an AL&W Lines (SP prototype) kit - one of the few that they offer in N scale. I also started driving piles for the built-in-place Portland Terminal #2 wharf. I debated for a while on how the best do this so I decided to see-saw back and forth between the scenery and structure. I first has poured the plaster bottom, then "surveyed" the pile locations and drilled them. Then I painted everything (course I found I needed to slightly enlarge the holes for the piles). The piles are 1/16" medical supply dowels from a liquidated doctor's practice - a box of 72 dozen is enough for a lifetime and more! Once these are installed, I will cut them down to the proper length,stain/paint and install the caps and braces to finish the bents off. 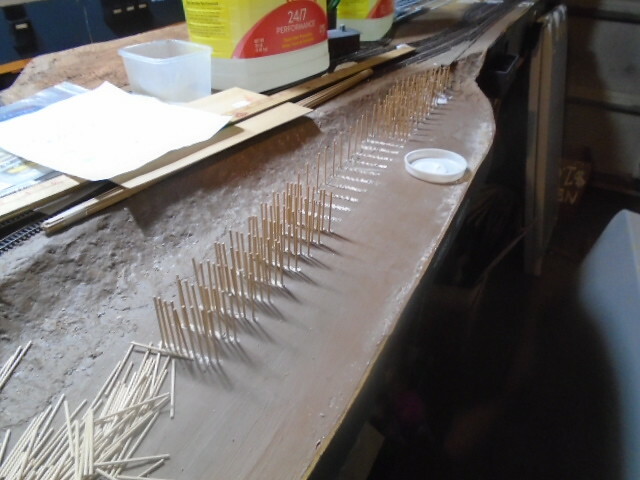 then its time for finishing the river bed and bank and getting the water poured. I stopped after installing 170 and took this pic or so as my fingers were getting sore from pushing these in...only 90 or so left to go. You, sir, win the glutton for punishment award for the month. Those piles look good, though you might want to prestain them in case the glue blocks doing so after scenery is put in place, but that looks tedious. Yep, I do plan to stain them. I did some test piles last night after I got all of the rest in place. Got smart and used a tack hammer to tap them in which was much easier on the fingers. This wharf will be a continual source of punishment as I need to build a bulkhead wall piece by piece on the ship side and plank the deck once I handlay the track. Once that's done, I get to tackle the complex resin freighter kit. It's all fun though - been looking forward to working in it for a while. Some more continuing progress over the past week...Finished installing all of the pile and got them all leveled off ready for the caps and braces that will finish them off. Also found out in this process that Sylvan Models freighter will need to get a 1/2" basswood shim carved to match the hull to bring the top of the holds closer to the wharf deck. Otherwise it looks a bit short and odd as the model is cut pretty short to the waterline (versus the pic on the box). 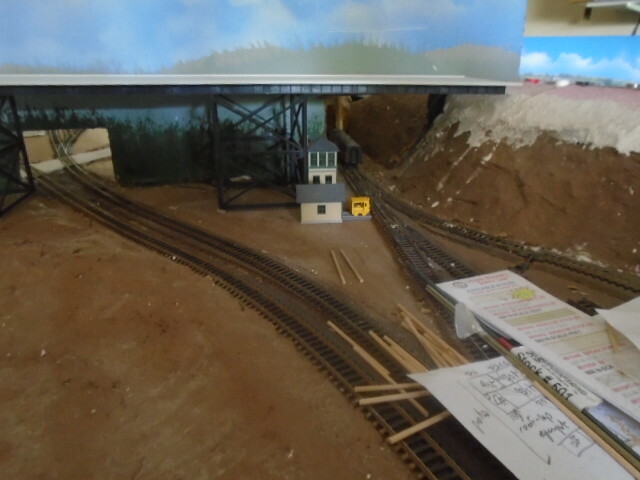 Started to work again on the east approach of the Steel Bridge and got the east approach embankment shimmed with foam to bring it to the right height. I didn't like how much of the backdrop I could see under the bridge and the hole cut-outs. I fixed the rightmost track (UP to Albina yard) by daylighting the hole larger. 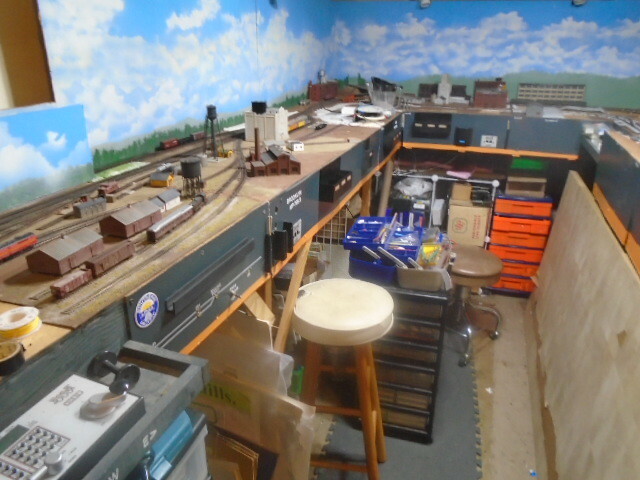 I had in the past continued the slope beyond the hole and I will scenic and ballast into to the staging yard approach so it seems less tunnel-like. The left side into Union Station is more problematic as the hole size is limited by the shorter west side approach bridge on the other side of the backdrop. I "created " some greenery on the backdrop to darken the area around the hole and may add some more 3D scenery but unsure. There's nothing here in reality as the tracks actually turn and go under the highway deck to cross the river, but I want that transition to disappear as much as possible. Lastly, I paved and painted Front Avenue and got the rest of the earth paint base and the first layer of earth down over the entire station area. 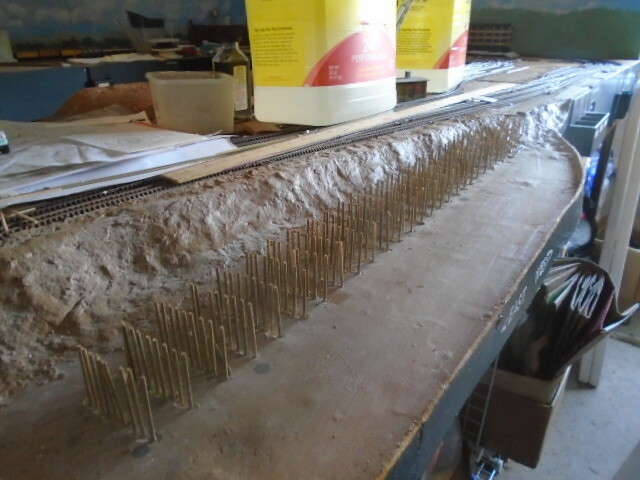 Ballasting is probably next. Finished up (other than a decoder) my GHQ W-3 Mike #1769. I put this kit together at work over 15 years ago across many lunch breaks and its been sitting in a box ever since. Since I've been on a tear lately, I got this into the paint shop and through the weathering to represent the mid 50's period. 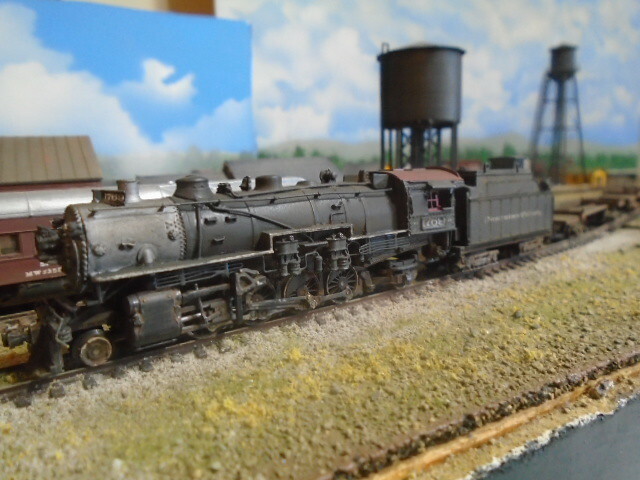 I had originally bought this to run on other's NP layouts, it could make appearances on this layout on the Seattle-Portland line on freights or even transfer runs. Feels good to get a big thing checked off of the list. 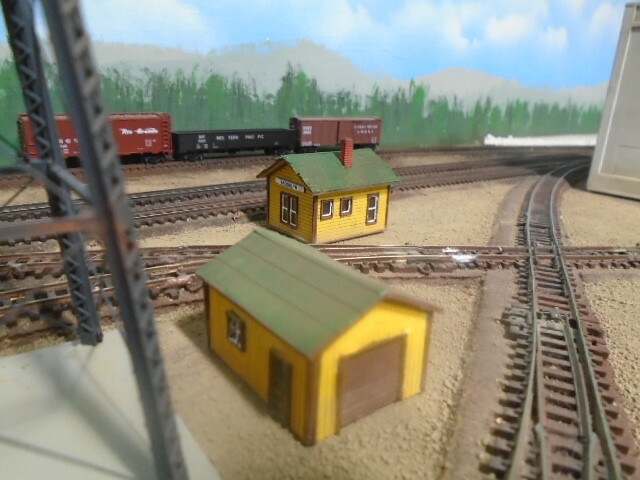 Finished ballasting the Union Station area and was adding more detailed scenery effects. 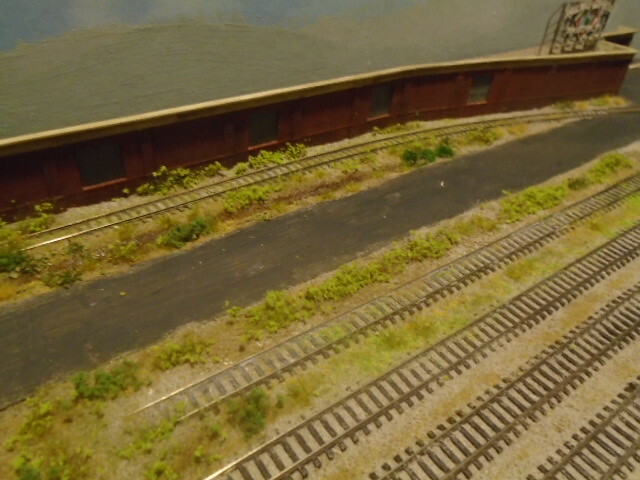 Put some muddy water into the ditch and added a bunch of grass tufts, weeds and blackberry vines to the REA siding and the outer yard tracks. Still need to do a bit more to the road before I stripe it and add the roadside details (fences, signs, electrical line, etc) . 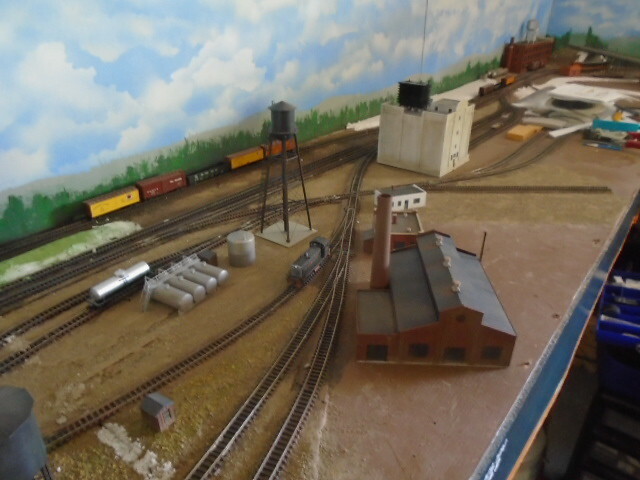 After a few month hiatus, I did get back to the workbench and complete the last two "structures" for the engine terminal outside of the service track/turntable/roundhouse area. This is the Brooklyn roundhouse foreman's office made from an old coach (took me forever to find a MDC Overland car to use for this ) and a oil-water separator. I did add some partitions in the coach and blanked out some windows so it wouldn't be so empty looking inside especially if i decide to light this later. Both are just sitting for the photo and not in their final locations. Did you ever get around to drawing up a current track plan? I'd be interested in seeing one. Not yet, but it probably would be a good idea even if it's just a schematic type not to scale plan. I'll use the engineer's choice and abuse PowerPoint some more.. I took a couple of days and drew the track plan up in PowerPoint. I'd call this somewhat to scale since I did use a grid and had been running back and forth with the yardstick putting things in their approximate locations. 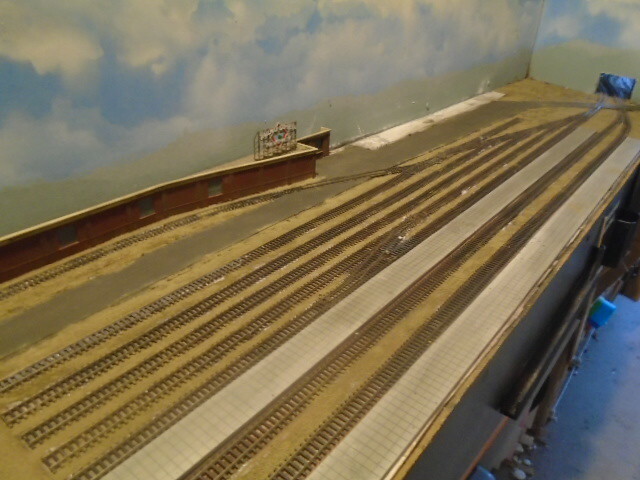 I think next I will draw up the switching area track schematics as those are needed to show car spots and the like. Where are you and the layout located? 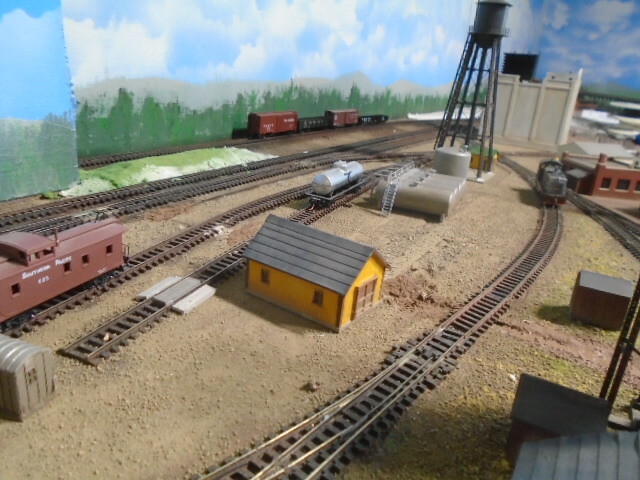 Myself and the layout are located in Salem, OR which is about 60 miles from the layout's actual modeling locale.